1 of 4 Place strawberries and 1/2 cup of the sugar in a medium bowl. Cover with plastic wrap and microwave on high for 1 minute. Stir and let cool. 2 of 4 In a large bowl, beat liquid egg substitute and remaining 1/2 cup sugar until foamy. Add mascarpone and vanilla; beat until smooth. In a separate bowl, whip cream until soft peaks form. Fold cream into mascarpone mixture. 3 of 4 Arrange half the ladyfingers in the bottom of a 9-inch square glass baking dish. Combine strawberries, raspberries and blueberries; spoon half the mixture over ladyfingers, followed by half the mascarpone mixture. Sift 11/2 tbsp of the cocoa powder over the top. Repeat layering. 4 of 4 Cover and refrigerate overnight. 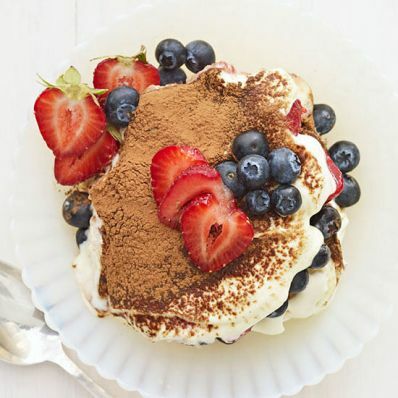 To serve, sift remaining 1 tbsp cocoa powder over top and garnish with additional berries.